Our order process for your bespoke joinery is a simple one. You start by making contact with us. You can do that in one of three ways. Give us a call on 07738535397 for Gary or 07851234680 for Craig. Call in to our workshop – details and directions can be found on our contact us page. Give us a quick call or text to check we are in before your journey. At this stage, if you know exactly what you need, we would be happy to discuss your order with you. Alternatively, you might not know exactly what you want. We can discuss your requirements and perhaps arrange a site visit. We can then give you some advice on the type or style of our bespoke joinery products that will suit your property. When a style has been agreed, your requirements and specification will be drawn up and a costing provided. We will also provide an estimated timescale for the manufacturing process based on our current workload. Once you have received your costing and are happy with the details, to proceed and secure your order we will require a small booking deposit. This will ensure you are booked into the next available production slot. Closer to manufacture, a further 40% deposit will be required. This will go towards the materials and hardware we need to purchase prior to manufacture. On larger orders we may require another interim payment during manufacture. 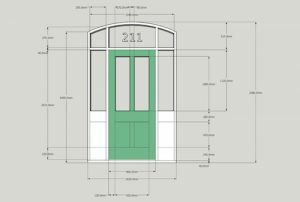 As all our bespoke joinery is made to order, every door, window or gate we manufacture is different. Consequently, in order to deliver a great product and service we have to pay extraordinary attention to detail. This can result in some orders taking longer to complete than anticipated. We will make all reasonable efforts to meet agreed production and delivery dates, but any such dates and times are intended to be estimates only and can be subject to change. When your bespoke joinery is ready we will call you to confirm the delivery or collection date. If we are installing, we will arrange a mutually convenient date for us to do that. The balance of the invoice is payable on delivery or collection of your order. If we are installing your joinery, the balance is due on the day (or in the case of larger orders, final day) of installation. As all of our items are totally bespoke and made to measure. All pricing is done on a job by job basis. Unfortunately as no two items are the same, prices can vary. Once materials have been ordered and work has commenced, the deposit is non refundable.